(November 2016) After weeks of suffering, David Tago went to be with His Lord on November 3, 2016. His final words were “God is still on His throne” and he challenged his closest family to follow in his footsteps. At a memorial service in Honiara on November 4, tributes from around the world were shared, showing the impact that David has had on many people. In the Solomon Islands, David was widely known for his leadership abilities as well as for his skill as a teacher. David grew up in Lavagu Village on Rennell and attended primary school on the island. He later went on to Su’u Secondary School on Malaita. From 1986 – 1987 he completed agricultural training in Papua New Guinea, then attended the University of the South Pacific’s School of Agriculture in Western Samoa for three years and graduated with a Diploma in Tropical Agriculture. Soon after returning from Western Samoa, David trained as a Secondary School teacher at the Solomon Islands College of Higher Education. From 1996 to 2005, he taught at various schools around the country. 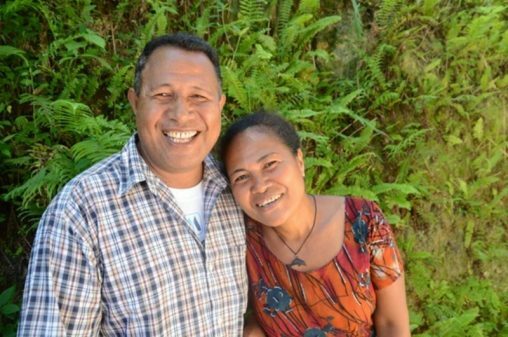 From January 2009 to November 2013 David and his wife Ribeka studied at the Christian Leaders Training College (CLTC) in Papua New Guinea where both obtained Bachelor degrees. David completed his BA in Biblical Studies. Upon completion of their studies, David and Ribeka became advisors for the Rennell and Bellona Bible translation project. 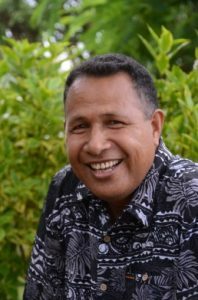 David was also selected to lead the Bible and Literacy Partnership Solomon Islands (BTLP SI) and until his untimely death in November 2016 he worked hard to promote the importance of Bible translation in the local languages of the Solomon Islands. Besides being active in the translation project, David has served the South Seas Evangelical Church in various ways, including as a deacon since 2005. He and Ribeka were also active in restarting one of the local SSEC churches in Honiara. David leaves behind four children: a son, Anue, and three daughters, Helen, Grace and Gralen. David’s passing is a great loss for the Isles of the Sea team and he will be greatly missed.